I look forward to the Purim holiday every year. It's so beloved to me because of how much I enjoy the act of giving. Plus all of the creative Mishloach Manos (gift basket) ideas and themes other people come up with are so cool to see. The children with their huge smiles and cute costumes has to be the best part of it all though. I am relieved to be finished with all of the planning, shopping, ordering and wrapping involved in the preparation of this fun filled Holiday ahead of us. I also greatly anticipate spending some good quality time with my family as we do every holiday. So anyways, to get into the whole Purim spirit I decided I would bake some Hamantashen (traditional Jewish triangle shaped pastry delights with delicious fillings of all sorts) last night. If you haven't tasted one you are missing out big time since they are just so delicious. I hadn't baked hamantashen since I was 12 mind you. But I thought that if I was able to do it then with ease it couldn't be too difficult now. I even followed a fantastic guide with a great recipe included but unfortunately I was very wrong about the whole thing. I baked 3 different batches but they were all epic fails! And just so you know, they were perfectly tasty, they just didn't look very pretty. I won't give up though-there's always next year. I'm pretty sure that by the time Sunday has come and gone I will have my fill of more appealing hamantashen. Have no fear I still have an awesome recipe/diy idea to adorn your Purim tables with or perhaps for a last minute addition to your mishloach manos baskets. 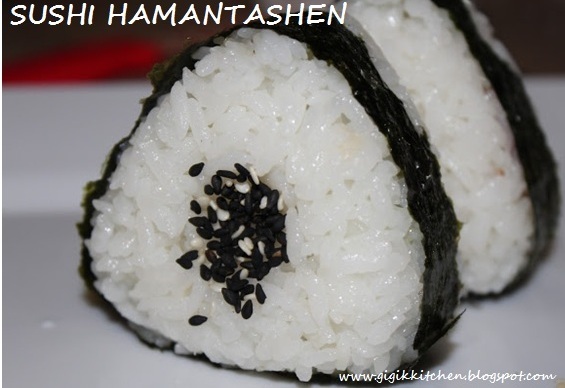 Around this time last year I stumbled across this adorable idea on the Busy in Brooklyn site for sushi hamantashen/Japanese originated onigiri. You've most likely seen it too. It's been mentioned by almost every Jewish Foodie and it's one pin that I'm pretty sure everyone has on their Pinterest Purim board. Sushi is one of my favorite foods and I love cute DIY projects so this was a must try for me. I was really excited to finally put together this fun project over the past weekend with the help of my husband who makes the best sushi rice ever just btw. Go check out her original post here to see how she did it along with her recipe and tips- the whole thing was super easy to follow and although I used our sushi rice recipe and the fillings of our choice it's all thanks to her that I was inspired to cook it up altogether! I've decided to share this little project/recipe with you today. Enjoy! Also, if you would like to do this project as well, I have linked to the Onigiri rice molds that I ordered from amazon right here. 1. Place the 3 cups of rice in a large bowl and fill about halfway with cold water to lightly rinse. Whatever quantity you choose to cook have in mind that you should always have 10% more water then rice. Swirl the water around the rice with your fingers and you will notice it becoming significantly cloudy. Repeat this a few times until the water is almost clear looking which can take 3-4 attempts. 2. Transfer the rinsed rice into a large saucepan. Pour in 3 1/3 cups of water and leave it to soak for about 30 minutes. 3. While the rice is soaking prepare the rice vinegar sauce that gets added later. Combine 1/2 cup of rice vinegar, 1/4 cup of sugar and 1/2 tsp of salt in a small sauce pan. Heat over a low flame stirring to dissolve the sugar and salt not allowing it to come to a full boil just heat long enough to allow the ingredients to come together. Then shut the heat and leave it to cool while you finish with the rice prep. 4. Take the large saucepan with the rice in it and place it on the stove top. Heat a high flame underneath it. And cover it with the lid. Avoid the temptation to lift the lid at all during the time it's cooking as it'll allow for the steam to escape and that steam is what gives the rice that desired fluffy texture. When the rice begins to come to a boil lower the heat quite a bit and allow it to simmer for 15 minutes. Once 15 minutes has passed turn off the heat and allow it to sit for another 15 minutes with the lid on still. 5. Transfer the rice to a large non metallic bowl and fold the rice vinegar sauce into the rice using a flat wooden spatula in short cutting motions which will separate the grains of rice without crushing them. While doing so use a paper plate with your other hand to fan at the rice to cool it which gives it a glossy look. Do this for about 10 minutes or until the rice has reached room temperature. Use the rice immediately. Mash the avocado with the lemon juice and salt to prepare this filling. B) Kani (Mock Crab)- in Stick form which can be purchased in the frozen section of many groceries. Chop the kani up into proffered sized pieces. 1. Using some handy triangle rice molds lay down a nice layer of rice packing it down a bit with a flat wooden spatula. 2. Drop a tablespoon or so of the filling in the center and then lay down a second layer of rice on top of it. 3. Push the "lid like piece" down into it to bring everything together. Mine had a little indent which I found handy as a mark for the sesame seeds. 4. In the back it should have a spring of sorts to push on to relieve the rice from the molds. Do so slowly and carefully about an inch away from a flat hard surface. If yours has the little indent in one side turn the molded rice over to have that face upwards. 5.Sprinkle a little bit of toasted sesame seeds into that crevice carefully using a cup or funnel. Push them down slightly with your fingers to stick them onto the rice a bit. 6. 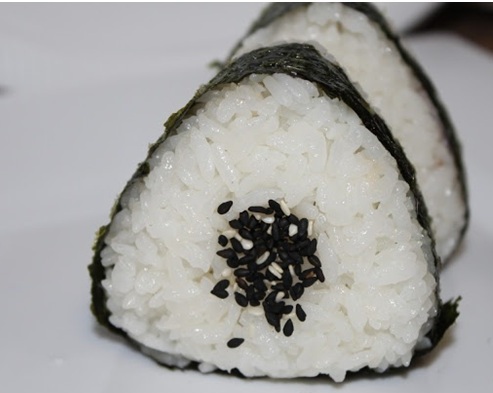 Cut the nori into strips that can be wrapped around the outer edges of the molded rice and then wrap them. Moisten the end piece and seal it where it finishes. Hope your Purim planning is going very smoothly! Thanks for stopping in! Have a lovely day! P.S. Go join my giveaway going on right now right here for 5 amazing Smashbox Cosmetics products- it ends tomorrow night- you don't want to miss it!